For your TY250 twinshock Yamaha this new Majesty style tank seat unit will set you apart from your fellow riders. Fiberglass construction with a slimmer profile for more rider maneuverability, not to mention great looks! 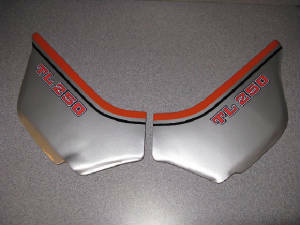 New for 2012 Honda TL250 side panels. Fiberglass construction, painted, graphics with push pin mounts. Look better than the factory originals! 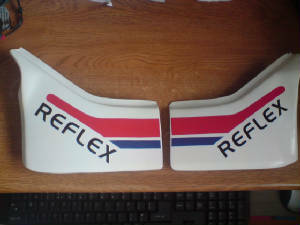 Replace your cracked or missing TLR200 side panels with our new fiberglass reproductions. These use original mounts and include graphics. 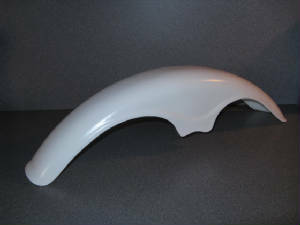 Reproduction TY250 and TY175 Original Style Front Fender. 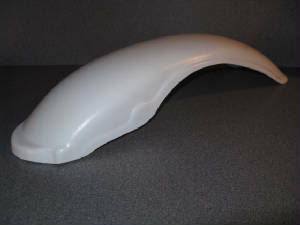 These are a plastic fender available in several colors. 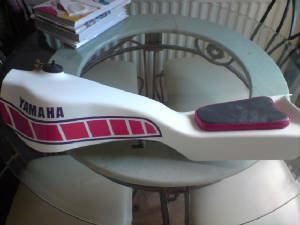 Reproduction rear fender for your Yamaha TY250 twinshocker. Available for both the 1974 and later models(1976 and later shown) in many colors.